A dismal report from China was a big factor. Shares of Ford Motor Company (NYSE:F) had a rough time in 2018, but December was especially turbulent -- with the stock price falling 18.7%, according to the data whizzes at S&P Global Market Intelligence. Yes, the market took a big hit last month, and that was certainly a factor. 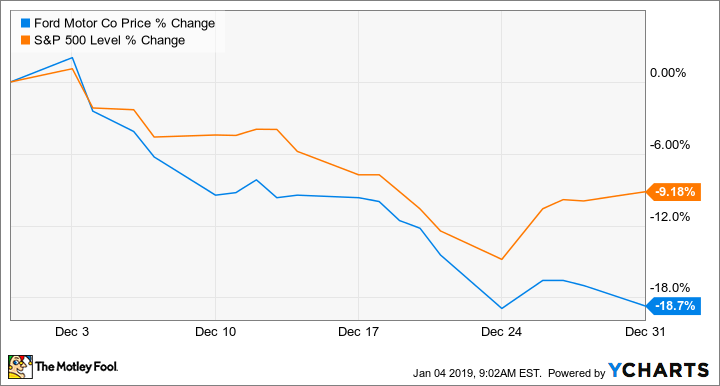 But Ford's dismal December decline was considerably more drastic than the benchmark S&P 500's 9.18% drop. Why was Mr. Market picking on Ford? The big concern is that China, once a promising growth story for Ford, has turned into something else over the last couple of years -- and the problems seem to be accelerating. We learned in December that Ford's sales in China tumbled a shocking 55% in November. That wasn't just a one-month fluke: We won't have full-year numbers for a few more days, but Ford's sales in China were down 34% in 2018 through November. The ongoing U.S.-China trade war and a slowdown in China's new-car market are looming concerns for all of the automakers that do business in the country, but Ford's declines have exposed deeper problems with the Blue Oval's regional effort. Key among them is a new-product cycle that has fallen behind that of faster-paced rivals. Ford is hoping that a new-product offensive will help boost its slumping China sales. The all-new Focus just arrived there; it's one of more than 50 new or revamped model variants Ford expects to bring to China by 2025. Image source: Ford Motor Company. Ford hired a new leader for China -- veteran executive Anning Chen took the helm on Nov. 1 -- and it has a turnaround plan underway. But it may take a while to see improvements on Ford China's bottom line -- especially if the trade war and market slowdowns continue to weigh on auto sales in the world's largest new-car market. We're awaiting Ford's fourth-quarter and full-year 2018 earnings report as well as its guidance for 2019. In the past, Ford has released its new-year guidance about a week before earnings, but it hasn't yet scheduled an event to do that this month -- we may have to wait until its earnings report on Jan. 23 to learn what Ford expects this year. But either way, we'll know much more about the company's financial state and its prospects for the new year in a couple of weeks.